Grace: What action is Ghana taking to address climate change? Kenneth: Ghana has developed several policies such as the National Climate Change Policy and the Nationally Determined Contribution (NDC). However, the government has remained at the policy level for too long of time with no proper mitigation and adaptation plans. For instance, the Climate Change policy mandates local assemblies to spearhead climate change action, but the big question remains, how well are these assemblies positioned and resourced to address climate change adaptation and mitigation? Civil society organizations have contributed immensely towards the development of these national policies and strategies and played a role in localizing international climate policies to suit the local context for the benefit of the citizenry. However, the collaboration in their implementation remains weak. This is essential and urgent. Grace: What was the highlight for the World Climate event you organized 11-12th July in Accra? Kenneth: It was an interesting scene to witness how countries are lobbied to take decisions for a better planet. It was an eye opening event that has kept me thinking even after the program on how best to save the planet. The World Climate event gave participants the opportunity to learn and acquire negotiation skills that they can use to influence their leaders to make commitments that will protect planet earth. The event was relevant in our context because the adverse effects of climate change are universal but more severe in Africa. Ghana is no exception with drought and flooding affecting citizens. The most affected are farmers: because the change in rainfall patterns is reducing crop yield and in some cases destroying farms, hence loss of livelihoods. Therefore, the simulation was useful and will go a long way to influence the opinion of our climate leaders when they have the opportunity to negotiate on behalf of their constituencies. Grace: What would you share with anyone willing to organize World Climate Simulation in their country/institution? Kenneth: The World Climate Simulation is an eye-opener and I encourage everyone who has had an opportunity to be trained to help train others and expose it to the citizenry. By so doing, we will create the needed awareness on climate change and change the attitudes of our decision makers. The World Climate event gave participants in Ghana the opportunity to gain insight about their role in addressing climate and experiment in a role-playing [simulation] environment how to advocate for positive action. 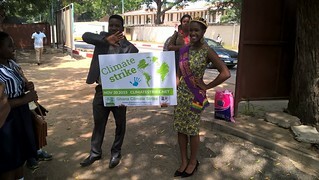 They were inspired to go back to their respective organizations and communities to impart the knowledge gained so that citizens become more informed and are able to put pressure on local governments to formulate climate change policies or make commitments that will serve their best interest. Grace: What did you learn as a climate activist? Kenneth: I learnt to create the needed awareness about climate change emphasizing that everyone’s actions affect the planet. I also learnt how to lobby decision makers to design policies that will safeguard our environment. Importantly, I have acquired negotiations skills through practical lessons among colleagues during the event and can confidently join any negotiation team to make strong views and push developed countries to commit more in reducing their emissions. I have been inspired and gained knowledge to make an impact in my community hence, now a climate change ambassador in my community. I have also learned what other countries take into consideration when committing to reducing their emissions or contributing financial resources to combat climate change. Kenneth Nana Amoateng is the executive director of Abibiman foundation and a social activist advocating for climate change issues, education, and human rights issues. Kenneth got involved in the fight to combat climate change after witnessing the adverse impacts of climate change that made his local community vulnerable after the washing away of the coastal lands of Tema manhean, a fishing community in which he once lived. As a young person, he decided to empower the community by creating greater awareness on climate change through the local community radio. He started speaking on radio to create the awareness on the causes of the washing away of the beach and what the community could do to become less vulnerable. He also established clubs in schools to educate young learners and worked with women on climate justice projects. Don’t be left out in experiencing the World Climate simulation and learning for yourself what action needs to be taken to ensure this remains a habitable planet. Be part of the solution, learn and help others learn about the dynamics of climate science and policy. Organize a World Climate simulation in your community/school/office. For more details, check out our facilitators’ resources kit here and/or register your interest here.